An annual fashion event to be reckoned with, the Met Gala! This years theme was Heavenly Bodies: Fashion and the Catholic Imagination. I had my finger on the refresh button all day so I could see the latest photos and videos as the celebs strutted the red carpet. And they didn't disappoint! It was a feast for the eyes! Is Instagram switching to 4 pictures across instead of the current three? In between all the will they, won't they, there is a lot of opposition to the move, because many Instagrammers have planned and curated their feeds based on the current 3x3 grid. Even my feed is based on the 3x3 grid. Like everyone else I'm working within the frame work that has been provided. Was my initial reaction one of horror, yes! Would this change completely throw off my current feed, absolutely! Do I want things to stay as they are? Sure, we all feel more comfortable with the known. But in the long run do I really care, not really. Maybe I’m being naïve, considering my Instagram planning and curation are most likely considered basic by some people’s standards, and I’m not an influencer, celebrity or big-name brand that has been building a perfectly curated feed for years. But if you are an influencer, celebrity or big-name brand you will most likely be posting more than once a day, so at that rate your current feed will be well below the page fold in an Insta-second! The biggest change I can see that people will need to wrap their heads around is that you’ll need to start thinking of your bigger picture/story in a landscape view instead of a square view. What do I mean, well when viewing your profile or viewing a profile from a search at the moment you’ll see 3 pictures across and 3 pictures down without scrolling. As below. Also only applicable if your Bio isn’t split over a number of lines. If the new 4 pictures across gird goes ahead you’ll see 4 pictures across but only 3 pictures down without scrolling. Image below for illustrative purposes. This is mostly applicable to those users who split one image into 9 tiles, you may want to consider splitting into 12 tiles instead of 16 tiles as the last 4 would end up below the fold. Other than that, you are still able to post in themes, colours, stories. No matter what I think, Instagram is going to do what they want to do. How many people protested and threatened to delete their accounts if Instagram changed the chronological ordering of posts? Or the introduction of sponsored ads? Instagram is a borrowed platform, we must play by their rules. I’m actually excited to see something new, to see how people use the new format, to be inspired again! Don't waste your money on the WRONG photographer! So many people know they need professional photos to capture attention online, but then choose the cheapest photographer they can find because they are scared that the money they are investing will be a waste. You want to know what the end result will be before you start handing over your money. Making sure you choose the right photographer is the first step in the right direction. These 3 steps will help you find a photographer that gets you. 1. Start with what you want, how do you want your products to look and feel. The best place to start is to create a Pinterest board, or a good old fashion vision board. Just go for it, without editing until you have 20+ images that embody the way you want your products to speak to your customers. 3. A big one from this exercise is to establish what type of photography you are looking for, are you looking for generic product/styled/flat-lay or lifestyle images. Now you are ready to begin your search for a photographer. Where do you start, the answer: wherever you are. You can search on google, Instagram, Facebook, freelance websites. Whatever you feel comfortable using start there, if you don’t find what you are looking for then try the next platform. Use search terms that you identified from you vision board exercise above, for example lifestyle photographer, product photographer, photographer offering in house styling services. 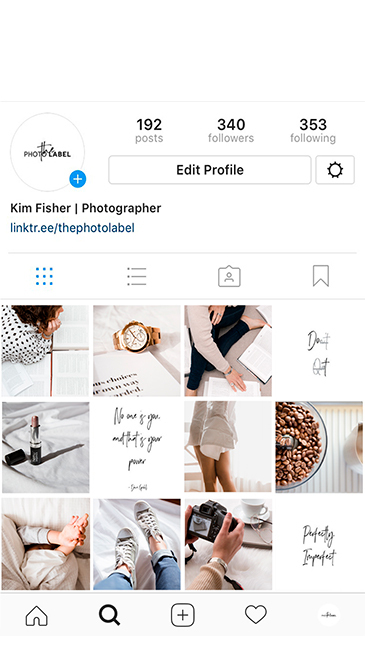 You will want to view the photographer’s online portfolio, on their website, not just their Instagram account. A photographer will only put their best work in their online portfolio. You’ll be able to tell from their portfolio which areas of photography they specialise in and their editing style. This will give you a feel for what your photos will look like if you chose to work with that photographer. By looking into their portfolio, you are looking into your future. Photography isn’t a cut and dry numbers game. There are more factors that go into creating that perfect image than meets the eye. The photographer will need to consider how many products you want photographed, the type of product (some products are trickier to shoot than others), if props/models/location will be used for a lifestyle photo shoot and more depending on your specific circumstance. So while some photographers websites might give an hourly or daily rate it is best to get a quote for your specific needs. And yes, you get what you pay for, but while price is an important factor it isn’t the only factor! You really want to make sure the photographer you choose matches the style and feeling that you are looking for in your products. You only get 5 seconds or less to make that all important first impression, so you want to make sure your photos are giving the right impression! If price is still an issue, start small and scale up. Choose your best sellers and let the photographer run with them. That way you can check if this will be a perfect match before going all in.